575-WB 1-Pair of Residential Winding Bars 7/16" to 1/2"
Replace worn garage door springs with our new replacement parts from Garage Door Supply Company. We stock right-wound torsion springs, left-wound torsion springs and universal winding cone sets. Browse our collection of residential garage door winding bars in the 7/16-inch to 1/2-inch size. 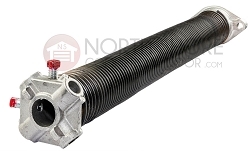 While torsion springs can last as long as 10 years, using the garage door as your front door can make those torsion springs work harder and wear out in half the time and cause the t orsion springs to break. Heavier garage doors also cause more strain on torsion springs, so make sure to replace them periodically if you use them heavily. Also shop our garage door replacement drums and bearings. All of our replacement parts for garage doors and garage door openers are new, not refurbished, so you can be sure you're getting quality parts. With our easy-returns policy, we guarantee your satisfaction. We also supply garage door opener remote controls and other accessories for every brand of garage door operator. With more than 35 years of experience in this business, you can trust our expertise when it comes to helping you keep your residential or commercial garage door operating safely and efficiently.